In late June and early July, NBC News, CNN, and The Wall Street Journal published stories that appeared at first glance to shed a lurid light on Donald Trump’s flirtation with Kim Jong-un. 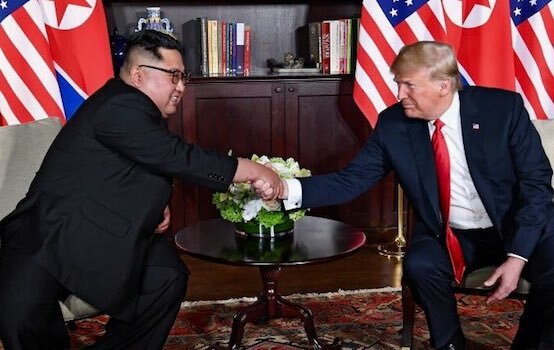 They contained satellite imagery showing that North Korea was making rapid upgrades to its nuclear weapons complex at Yongbyon and expanding its missile production program just as Trump and Kim were getting chummy at their Singapore summit. In fact, those media outlets were selling journalistic snake oil. By misrepresenting the diplomatic context of the images they were hyping, the press launched a false narrative around the Trump-Kim summit and the negotiations therein. If the authors’ point was not clear enough, Joel Wit, the founder of 38 North, who helped negotiate the 1994 Agreed Framework with North Korea and then worked on its implementation for several years, explained to NBC News: “What you have is a commitment to denuclearize—we don’t have the deal yet, we just have a general commitment.” Wit added that he didn’t “find it surprising at all” that work at Yongbyon was continuing. Another witness NBC found to support its view was James Acton, co-director of the Nuclear Policy Program at the Carnegie Endowment for International Peace, who declared, “If [the North Koreans] were serious about unilaterally disarming, of course they would have stopped work at Yongbyon.” That was true but misleading, because North Korea has always been unambiguously clear that its offer of denuclearization is conditional on reciprocal steps by the United States. But the shock effect of the story itself was hardly seismic. It turns out that the images of a North Korean solid-fuel missile manufacturing facility at Hamhung showed that new buildings had been added beginning in the early spring, after Kim Jong-un had called for more production of solid-fuel rocket engines and warhead tips last August. The construction of the exterior of some buildings was completed “around the time” of the Trump-Kim summit meeting, according to the analysts at the James Martin Center of the Middlebury Institute of International Studies. So the most Pyongyang could be accused of was going ahead with a previously planned expansion while it was just beginning to hold talks with the United States. But when this writer spoke with Schmerler last week, he admitted that the evidence of Kim’s intentions regarding nuclear and missile programs is much less clear. I asked him if he was sure that North Korea would refuse to give up its ICBM program as part of a broader agreement with the Trump administration. “I’m not sure,” Schmerler responded, adding, “They haven’t really said they’re willing to give up ICBM program.” That is true, but they haven’t rejected that possibility either—presumably because the answer will depend on what commitments Trump is willing to make to the DPRK. These stories of supposed North Korean betrayal by NBC, CNN, and the Wall Street Journal are egregious cases of distorting news by pushing a predetermined policy line. But those news outlets, far from being outliers, are merely reflecting the norms of the entire corporate news system. A media complex so determined to discredit negotiations with North Korea and so unfettered by political-diplomatic reality seriously threatens the ability of the United States to deliver on any agreement with Pyongyang. That means alternative media must make more aggressive efforts to challenge the corporate press’s coverage. This article was posted on Thursday, July 12th, 2018 at 11:11pm and is filed under Donald Trump, Journalism, Media, Media Bias, North Korea, Nukes, President Kim Jong-un, United States, Weaponry.